Every year, the national Barn Owl Trust publishes a report on the “State of the UK Barn Owl Population”. This report aims to quantify Barn Owl populations throughout the country, as observed by numerous local volunteer groups. Our East Anglia Nest Box Scheme is one such group. Established in 2002 and for the last 5 years run jointly as the S.O.S. & Thornham Owl Project Nest Box Scheme, it currently maintains and monitors around 300 wild owl nest boxes locally. Within the context of the UK, the scheme works in tandem with the Suffolk Community Barn Owl Project. As a body, this is one of the larger local monitoring groups, checking 1,402 sites during 2017. The amalgamated Suffolk groups reported an encouraging increase, with 366 of the 1,402 sites being nested - 41 more nests than in the “bumper" year of 2014 and 51% more than the average of all previous years. 2017 proved to be an exceptionally good one for the Thornham Owl and East Anglia Wild Owl Nest Box Project, recording 152 Barn Owl pulli (young birds ringed in the nest) in the year and surpassing our previous high of 2014. In safe hands... working under a DEFRA-issued Disturbance Licence, the data collected by our project will be fed back to the Barn Owl Trust as a contribution to the annual survey. Approaching a wild owl nest box without such a licence is unlawful. Nest box checking commenced in the first week in June and it was soon clearly evident by the amount of debris left in some boxes that in some cases pulli had already fledged. Our project leader Roger observed that in hindsight this was probably due to the very warm spell in late March, to which some Barn Owls possibly took advantage and commenced early breeding. Obversely, others started late breeding when the weather conditions took a turn for the worse in May, and as a result, our team were still ringing Barn Owl pulli in late September and well into October. Another success story in 2017 found just under half of the 46 Kestrel nest boxes in our project being used, with a record 88 pulli being ringed - a pleasing 4.4 being the average brood size and surpassing the figure for 2012. This was an excellent result as the BTO (British Trust for Ornithology) now have the Kestrel as Amber Listed, being of conservation concern. 2017 saw a reasonable year for Tawnies, with 10 boxes yielding 19 pulli. Though second only in results to our record year in 2014, there is an urgent need to expand our knowledge of this species. A trio of Tawny owlets nestle amidst the detritus that accumulates inside a busy nest box, which the team will clean when the opportunity arises later in the in the year. We need to be in the best possible position to provide advice on issues that may impact Tawny Owls, whether they are in planning policy, alterations to agri-environment schemes, the management of our woodland estates or climate change. The BTO is organising a survey to establish the demise of this specie, aiming to bring more people into contact the Tawny Owls to improve our knowledge of how their population is faring and working with local groups to support monitoring work. We would like to take this opportunity to thank Thornham Owl Project volunteers Roger and Kevin who, supported by Suffolk Owl Sanctuary volunteer Steve and funded by the contributions made by S.O.S. supporters, tirelessly build and venture out to erect, monitor and repair or replace the wild owl nest boxes in our joint venture, for which Roger collates and then submits the detailed information that the Barn Owl Trust study depends upon. Recent heavy snowfall and blizzards brought the county of Suffolk to a standstill as it was visited by the Beast from the East just a week or so ago. The Sanctuary site was no exception with drifting snow causing a hazardous, though beautiful, landscape. Due to concerns for the safety of visitors during such treacherous conditions, the site was reluctantly closed to the public for several days. The falconry team struggled through the frozen wastes to continue their dedicated care and attentive monitoring of all the sanctuary’s resident birds and to remain on call for hospital casualties. Although all birds of prey are well equipped to deal with sharp drops in temperature and adverse conditions, staff still observed their charges diligently to spot any vulnerability swiftly and to prevent the health of any bird being compromised by the unusual situation. In order to make sure that all birds had extra resources to draw on, feed quantities were increased and the temperature of the mews room in which the non aviary birds are accommodated overnight was raised. Our Steppe Eagle, Mir, was totally in her element as she exercised on the frozen flying ground. Falconers increased the frequency of their usual observation rounds and daily checks were carried out on all outside accommodation to ensure that roosting spaces all remained dry and draught free. Owls and other birds of prey possess extremely thick and plentiful plumage in order to deal with sudden periods of inclement weather and under the watchful eyes of the falconry team, all Suffolk Owl Sanctuary residents took the snowy conditions in their stride - it was evident that some positively enjoyed the experience! Our friend Mishka the Snowy Owl also felt totally at home in the white stuff - her cousins in the wild are able to withstand temperatures as low as -40º C, though it didn't drop quite as low in normally Sunny Suffolk! We look forward now with optimism to the more favourable Spring weather which will, hopefully, encourage a successful breeding season. 2017 proved to be a very successful one for our colony of Red Squirrels as both of our breeding pairs had litters, with a total of eleven kits being born. Red squirrels are very fragile animals with the odds stacked against them in terms of breeding - even in captivity - but we were able to watch them grow from the tiny nervous babies that first appeared in the middle of the year into confident, acrobatic adults. One of the pens during 2017 had company in the form of three Reeves pheasants. They helped keep the pen clean and also provided some company for the squirrels. On more than one occasion the baby squirrels were seen sneaking down to drink the pheasants water, and prising the lid off the pheasant’s food dispenser to steal the grain inside. The majority of the youngsters have now moved on to new homes, either to be added to controlled Red Squirrel release programmes where attempts are being made to re-establish colonies in the wild, as new blood for other breeding programmes or to help others illustrate the plight of these rare, amazing and delightful animals to their own visitors. Needless to say, we look forward to more new arrivals this year. As for our Meerkats, 2017 proved a hard one for our mob as sadly both the dominant male and female, Bandit & Bonnie, passed away due to illness. This left the mob not only without their parents but also without a leader! However, after some squabbling about who would take over and some diligent monitoring of behaviour by all the staff who care from them, the meerkats are now back to their usual ways and ready to face another year of being in the spotlight as a popular attraction for all who visit the centre. Looking back on 2017, the highlight of the meerkats year was Halloween - our Mob love pumpkins, and they had a ready supply of carved pumpkins prepared by our volunteers, both to play with and to eat. Fun for all come Halloween! After a long summer of entertaining the public, the meerkats have been resting up over the winter, spending most of their time inside basking in front of their heater or snoozing under the heat lamp. They have had some new toys to keep them amused, plenty of their favourite bugs and on a couple of occasions even came out to investigate the snow. Needless to say, as desert animals they were not particularly impressed with the white stuff! They and we are looking forward to the year ahead as The Mob prepare to bring pleasure to all that come to see them. Kestrel Cast Down - but not out! Throughout the year, amongst those we sadly receive into our bird of prey hospital are beautiful Kestrels. This little girl was one of them and we suspect like so many, her injury caused by being hit by a car. The Kestrel was brought into us by a lovely family who had seen the bird injured at the side of the road: after turning their car around and collecting her, they drove to the Centre where we received her in a soaking wet, very skinny condition and barely clinging to life. Feeling it unwise to leave her overnight for fear that she would not survive, one of our team the Kestrel home and fed her through the night. Visiting the vet the next morning, it was discovered the bird also had an injured leg, the remedy being to put it in a cast for support during the recovery period..
Whilst gradually bring her condition back to normal, for the first 10 days of her treatment we gave her physiotherapy on her left foot twice a day, which involved gently opening and closing her talons. The picture on the left shows her standing with her closed foot but by the end of the treatment (right) she was able to keep her foot fully open. After physio, the kestrel was able to fully extend the talons of her left foot. From there, the kestrel went from strength to strength. Shortly after the cast was removed, she spent a week in one of our secluded rehabilitation aviaries and after a final check over by the vet, she was released back to the wild nearby to where she was found. It took quite a time to get her back to health - but it was worth every second! Having joined forces with the Thornham Owl Project to form the S.O.S. & Thornham Owl Project Nest Box Scheme, supporters of the Suffolk Owl Sanctuary has been instrumental in funding the development of a network of roosting sites for the local population of Barn Owls and other wild birds of prey. Project leader, Roger Buxton reports that 2017 has been a record year, with 152 Barn Owl pulli ringed. This surpasses the previous high of 2014 when 147 were ringed - a successful outcome which brings the grand total of Barn Owl youngsters ringed over the last ten years to 715. In 2017, nest box checking began as usual in the first week of June and it quickly became evident, by the amount of debris found in some Barn Owl boxes, that young had already been fledged. This was due to a very warm spell of weather in late March of last year, which it is thought encouraged some early breeding. When weather conditions took a turn for the worse, breeding was delayed again. As a consequence young were still being ringed in late September and well into early October. Barn Owl brood sizes were as follows: 10 broods consisted of 1 chick, 13 consisted of 2 chicks, 17 boxes contained 4 chicks and 3 contained 5 youngsters, giving an average brood size of 2.81 - a very productive year, though falling just short of the exceptional average brood size of 2014. 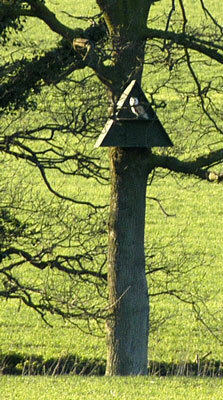 Barn Owl boxes also proved to be a target for a variety of “squatters”! These included stock doves (50), hornets (2), jackdaws (34) and a solitary squirrel. This is a particularly satisfying result for the project since the British Trust for Ornithology have raised the conservation status of the kestrel to “amber”. Kestrel boxes also showed evidence of other unusual occupants such as squirrels and jackdaws. Roger and his colleagues reported a reasonable year for the project’s Tawny Owl boxes; 8 of the 47 boxes had been used and two nest sites within the boxes produced 19 pulli. These figures seem to reflect the worrying national trend for the gradual but consistent decline of this bird over the last few years, which saw it’s conservation status elevated from green to amber in November 2017. The BTO is currently undertaking a survey to investigate the demise of this bird more closely and are launching a programme designed to bring more people into contact with Tawny Owls, improve their knowledge of the bird’s condition and support monitoring work undertaken by local groups. Hopefully, this proactive initiative will kick-start long-term projects and ultimately increase the breeding success of Tawny Owls. The Suffolk Owl Sanctuary and its supporters are indebted to Roger and his colleague, Kevin who have continue to devote many, many hours to the nest box scheme; the building, erecting and maintaining boxes and weighing, measuring and ringing of pulli to support and encourage positive outcomes for our local owl populations. This valuable initiative builds, sites, cleans and repairs a network of boxes which provide safe & secure out of roosting for Barn Owls and other birds of prey which are out of harm's way. If you would like to sponsor an owl nest box, in your own name or on behalf of a relative or friend, please call our admin. team on 0345 680 7897. Sponsors will receive a certificate of thanks, supporters’ enamel lapel badge, S.O.S. newsletter and wooden fob bearing the identification number of their sponsored box. Alternatively please click the button below and help us raise funds to buy an off-road vehicle to replace the beloved “Hilda”, which enables us to get off the beaten track and reach the many remote sites where our nest boxes are isntalled. The North Wind Doth Blow! 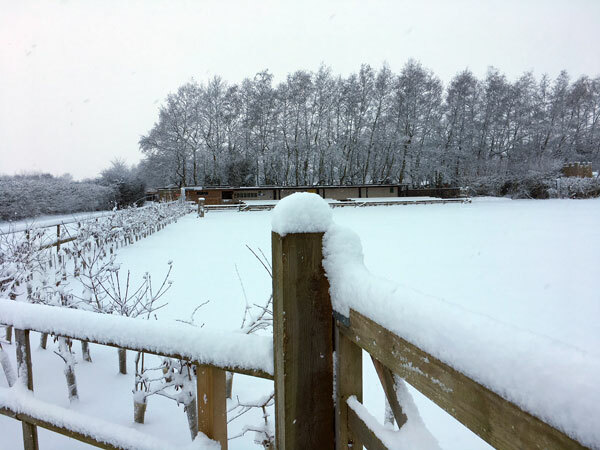 Despite concerted efforts to convince ourselves that Spring is just around the corner, Suffolk was hit by a cold snap and a covering of snow this week. Luckily, our birds are all well insulated with plumage and housed in warm dry accommodation, so they are not adversely affected by plummeting temperatures. Many of our display team originate from parts of the globe that suffer harsh weather conditions and are well suited to dealing with wind chill factors such as those experienced recently. Others are migratory birds which move to warmer climes when cold weather hits. Either way, snow is still a fairly rare occurrence at the sanctuary and one that must be celebrated by both man and beast! The falconry team flew several birds free this week, enabling them able to experience this strange phenomenon called snow. Rocky weighs up the strange white world and icy pond! Rocky the Turkey Vulture, a species more used to enjoying scorching American temperatures, seemed perfectly at home in the crisp winter atmosphere and continues to progress well in his training to become part of the seasonal flying team. Mir, the Steppe Eagle is a migratory bird hailing from the cold steppe region of central Asia and southern Russia, ranging easterly from Romania to Mongolia. Steppe regions and their human, mammalian and avian inhabitants are subject to incredible extremes of temperature, ranging from 45 deg. C (113 deg. F) in summer to -55 deg. C (-67 deg. F) in the winter months. Mir the Steppe Eagle feels at home as the temperature drops! These areas also experience huge contrasts in the day and night-time temperatures - in the highlands of Mongolia daytime temperatures of 30 deg. C (86 deg. F) can plummet to sub-zero figures at night. Mir, then, is easily able to take a delicate sprinkling of Suffolk snow in her stride and appeared to thoroughly enjoy the nippier conditions! Lincoln the Bald Eagle - now reaching his maturity - has rarely seen snow in his five years of life, but his genus is well equipped for a colder climate. The Bald Eagle’s natural range includes the northern American states and Canada - when numbers were somewhat depleted during the 1950s, the species was restricted to Alaska and the Aleutian Islands. Juvenile Bald Eagle, Lincoln, comes in for a snowy landing. Like the Steppe, the Bald Eagle migrates to warmer climes in winter, namely Florida, Louisiana, the Sonoran Desert and northern Mexico. Having been somewhat spoilt in the relatively tropical Suffolk climate to date, Lincoln was unphased by the wintry conditions and behaved impeccably - giving shivering visitors to the sanctuary a heartwarming impromptu performance! Despite the birds’ apparent pleasure at cold weather flying, the humans of the sanctuary hope that it won’t be too long before they are putting the birds through their paces in more sultry conditions!! Many thanks to Jess for the photos, one of our multi-talented falconers, who is also a dab hand with the camera, and to Cathrine, our lady of letters who penned today's blog! Visitors to the Suffolk Owl Sanctuary are always mesmerised by our trio of magnificent eagles; Mir the Steppe Eagle, Lincoln the Bald Eagle and Pungu the Bateleur Eagle. Sitting out on perches on the Eagle Lawn, people can observe the birds at close quarters and fully appreciate their elegance and power - one only has to consider the size of an eagle’s talons to fully comprehend what ultra efficient hunting machines they really are! Mir the Steppe Eagle is the great matriarch of the sanctuary, having resided here since the inception of the centre over 20 years ago. Although one would assume that she is now considered to be quite an elderly bird, this is not the case - in the protected environment of the sanctuary, enjoying a plentiful food supply and with no fear of predators, she is likely to live into her late 40s or early 50s, so is actually in her prime! Lincoln the Bald Eagle, on the other hand, is just reaching maturity, having only arrived at the sanctuary in 2012. Young Bald Eagles are comparatively unattractive birds, having drab brown plumage and no distinguishing features. Over the last five years, however, Lincoln has metamorphosed into a supremely elegant bird displaying striking mature plumage and the iconic white head and yellow beak, eyes, and feet of his species. Lincoln, our maturing Bald Eagle, communicates with visitors! The name Bald Eagle comes from the greek Haliaeetus Ieucocephalus meaning sea (hali) eagle (aietos) white (lLeuco) head (cephalos) in recognition of this most recognisable feature. Pungu, the Bateleur Eagle has been entertaining visitors as part of the flying team for over ten years. Like Lincoln, she arrived at the sanctuary as a somewhat insignificant brown youngster, but over four or five years blossomed into the eye-catching black and scarlet individual who turns so many heads today. Bateleurs are unique within the eagle world due to their ability to walk and jump backward, enabled by their unusually short tail. This feature is an absolute necessity for an African bird which enjoys a diet inclusive of snakes; the bird must be able to retreat nimbly from the strike of these reptiles when hunting. The enduring popularity of our eagles has recently prompted us to offer a new falconry course for 2018 - The Eagle Experience. This unique, sanctuary based course will present the opportunity for visitors to spend exclusive time with our magnificent eagles and a designated falconer, gaining a real insight into the nature and behaviour of these powerful raptors and experiencing them in awe-inspiring flight at close quarters. Click here for further details. For details of this or any of our wide range of falconry activities, please ‘phone our admin. team on 0345 680 7897. The S.O.S. red squirrel colony enjoys luxurious accommodation within the centre’s pretty Woodland Walk. Three tall, spacious aviaries connected with unique treetop walkways provide the extensive habitat and aerial cover that these solitary animals enjoy: there are plenty of communal areas where family members can congregate but also lots of secluded nooks and crannies in which individuals can enjoy some peace and quiet. One measure of the squirrels’ wellbeing, both physical and psychological, is their breeding success. During 2017, there were seven kittens born within the sanctuary’s colony (from two breeding pairs) - an achievement of which we're proud. There are many reasons for the fragility of red squirrel populations. Firstly, the genus is inherently susceptible to the squirrel pox virus, unlike the more robust grey squirrel with which it must necessarily compete. Secondly, red squirrels feed less efficiently in the broadland woodlands of their favoured habitat than grey squirrels - the latter can survive at densities of 8 per. hectare, whilst red squirrels are only successful at a density of 1 per. hectare (and as low as 0.1 per. hectare in coniferous woodland). Red squirrels also suffer at the hands of a number of predators such as birds of prey and pine martens with the breeding patterns of the latter correlating directly with fluctuations in red squirrel numbers. The modern world also encroaches on red squirrel populations - in some urban areas, domestic cats pose a new threat and throughout all rural areas of the U.K. evidence of the devastation caused to both red and grey squirrel populations by traffic is plain to see on the roads. There are estimated to be only 140,000 red squirrels in Britain presently, compared to 2.5 million greys, so the necessity of captive breeding programmes has never been more apparent. Successful progeny from the S.O.S. squirrel colony are usually transferred to other national breeding centres, to introduce new blood lines and improve the gene pool, most notably the Isle of Wight Red Squirrel Trust. The geographical advantages of this small island are particularly conducive to successful breeding with the Solent providing a barrier to the infiltration of grey squirrels. As it is illegal to introduce a grey squirrel into red squirrel territory with a penalty of two year’s imprisonment or a £5,000 fine, the island offers an insulated, protective environment. Captive breeding centres are also now established in many parts of the U.K including Surrey, Cornwall, Kent, Brownsea Island, Yorkshire, Jersey and Tresco. The seven most recent Suffolk Owl Sanctuary progeny have just settled into their new home in Hereford, where we hope they will enjoy many years successfully breeding their own young. Visits to S.O.S. are sometimes made by the most unexpected people!! Just such an instance occurred recently when ten police officers of Suffolk Constabulary joined us for an instructional morning. The officers are all connected to the force's rural beats and were interested in expanding their knowledge of owls and other birds of prey. Titch the Tawny Owl and Pippin the Barn Owl display impeccable behaviour whilst sitting on the long arm of the law! During the course of their usual duties throughout the Suffolk countryside, the police are often involved in situations concerning wild animals and birds. Although agencies such as the R.S.P.C.A., the R.S.P.B., the Suffolk Wildlife Trust and the Suffolk Owl Sanctuary exist to meet the specific needs of local wildlife, the police often find themselves playing a supportive role in such incidents, so Suffolk Constabulary felt it important to equip their officers with knowledge in this area. The day began with an introduction to some of the sanctuary’s native bird population - these being the species that the police would come into contact with out in the field. Instruction concentrated on bird recognition - in order that police could relay accurate information to other agencies called in to assist them - and bird handling in order for officers to gain a degree of protection and confidence when dealing with beaks and talons at close quarters! It is hoped that the skills acquired during time spent at the sanctuary will prove useful to our visitors in their line of duty and that their time spent with the falconers has raised awareness of some of the issues facing our beautiful but vulnerable native bird population. The police visit evolved from a perceived rise in wildlife crimes in general and incidents involving birds of prey specifically. In particular, numbers of wild bird shooting cases have escalated in the last couple of years. The “protected" conservation status of many of the birds involved then demands criminal investigation. Identity Parade! General Manager Maz and Falconer Liz hope that their road tax and M.O.T.s are up to date! As a response to this worrying development, Suffolk Constabulary took time to re-assess their efficiency in this context. It was decided that some time and resources spent on the area of wildlife crime would be justified in order to embed a more comprehensive understanding of the challenges facing Suffolk wildlife and, consequently, elicit a more robust response in such instances. The police day at the sanctuary was not a case of “all work and no play” however and all the officers thoroughly enjoyed their time in close community with our birds as well as taking in a much appreciated flying display. The raptor hospital at Suffolk Owl Sanctuary is the only such facility serving the Suffolk area. As such, it is a hive of activity throughout the year, but particularly during the late Spring/early Summer months when progeny are maturing and taking their first tentative steps into the airborne world! Unusually, four of the kestrels are siblings and were brought into the hospital together. During clearance work in a local garden, a number of trees were felled and unfortunately, one of the trees contained a nest site in which one diligent kestrel couple had been rearing their four chicks. After such a major dissembling of the kestrel’s habitat, there was no likelihood of the parent birds returning to their brood, so the concerned house owner immediately stepped in. The four youngsters were wrapped up and placed in a lidded box, to offer dark quietude during their journey to the sanctuary, in the hope that the stress and shock of their ordeal would not prove too much for the tiny birds. 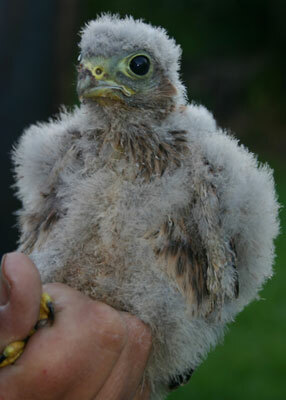 On arrival, the falconry staff ascertained that the kestrels were just over two weeks old and, apart from suffering understandable shock at the loss of their nest, were otherwise in good condition. Had the tree clearance happened a week or so earlier, the outcome for the young birds would have been severe, as young kestrel chicks need constant brooding for the first 10 - 14 days of life. Our hospital admissions had just passed this crucial landmark and now had the ability to regulate their own temperature. Their father had also been conscientious in his provision of food for mum and babies, as their body condition was good, so thanks to the parent birds’ hard work, the quadruplets had a great start in life and the best possible chance of survival. We were happy to step into the breach left by the adult kestrels and continue to feed, monitor and protect their progeny. the hospital ward to a secure hack site. Our raptor hospital is a busy place at this time of year - young owls and other birds of prey are finding their wings and, like all novices, some will find it harder to master new skills than others! Those that need a little extra help often turn up at the hospital, having fallen from a nest site or suffered a mishap through lack of confidence! At the moment, six hospital places are being occupied by half-a-dozen Little Owls who came a cropper whilst testing their wings for the first time! The babies all arrived at the hospital as individual cases, but have soon made each others' acquaintance and when the time comes will be hacked out as a group. Now We Are Six! (even though you can only see five of us). The six fledgling Little Owls all bonded very quickly. Like some other owl species, Little Owl numbers are in rapid decline in the U.K. Results from the British Trust for Ornithology’s bird surveys indicate that numbers have fallen by 64% since the late 1960s and that current breeding pairs number 5,700. One factor working against this vulnerable bird is it’s lack of formal conservation status in the U.K. It is excluded from the Birds of Conservation Concern list due to the non-native status of the Little Owl, the species having been introduced to Britain in the late 1800s. If it was eligible for inclusion, however, the Little Owl would be red listed, having declined in population by more than 50% over the last 25 years. After many failed attempts to establish this owl in Britain, the first successful breeding was recorded in Kent in 1879 and by 1909 Little Owls were successfully established in habitat as far north as Derbyshire. Today, the largest populations are to be found in the South East of England and Suffolk seems to be a particular hot spot for this pretty little bird. This may in part be due to the fact that Suffolk is a rural area, with plenty of oak and ash (favoured by Little Owls) and a retention of old orchards - fruit trees are also a hit! Notoriously difficult to spot, it is likely that there are many more Little Owls in your local area than you realise! Not only are they almost exclusively active at dawn and dusk, rather than during the day; they are also extremely well camouflaged at times when they are “visible”. The six youngsters currently being cared for in our hospital are all “branchers”. This term is used to describe young owls which have fallen when they have “branched out” from their nest, as their flight feathers are developing, and they make their first attempts at flight. Such casualties are usually found members of the public walking their dogs - obviously this is a morning and evening activity, when the owls are at their most active. Unlike Barn Owls, which will not feed young which have fallen from the nest, Tawny and Little Owls will continue to feed and care for their young branchers, so although such vulnerable looking chicks may appear to have been abandoned, their parents will probably know exactly where they are! The best advice, therefore, on finding a baby Little Owl in such circumstances is to leave it alone, unless it is in imminent danger or is obviously injured. In the latter cases, then removal to a place of safety and care is necessary. To do this, pick the baby up gently in a towel or jumper, place it in a covered box and keep it in a quiet, dark place until you can transport it to your nearest rescue facility. You can find more details on our website here but please, WASH YOUR HANDS after handling a wild bird. You will find a list of contacts for rescue centres on our website here. If you are located in Suffolk, please telephone the sanctuary for advice or hospital admissions on 0345 680 7897 (option 4). These six branchers currently being cared for in our raptor hospital are now feeding independently and are of good body condition. This means that within the next couple of weeks, they will be transported to a secure, secluded hack site where they can enjoy regular supplies of food and protection until they choose to strike out on their own. On 21st. June the county of Suffolk celebrated the first ever Suffolk Day - an idea championed by Mark Murphy of Radio Suffolk and supported by the East Anglian Daily Times. Suffolk Day is a new initiative encouraging people throughout the county to fly the Suffolk flag and celebrate everything that’s great about the county. We were glad to join in by offering reduced-price admissions on the day as the St. Edmunds flag was proudly flown outside the centre and Suffolk bunting adorned reception. In a shrinking world, where people are able to communicate, trade and interact with others on a global scale, Suffolk Day offered an ideal opportunity to reflect on the beauty and diversity that exists right on our doorstep and to appreciate our wonderful locality. Suffolk offers big skies and pretty landscapes, breathtaking coastline, delicious food, innovative businesses, quaint market towns, exciting nightlife and, above all, friendly natives! Over the last few months Mark has been raising awareness of Suffolk Day with local businesses, councils, visitor attractions and residents and the birds and staff at the owl sanctuary have been vociferous in their support! Every year we oversee the hatching of several progeny from a variety of the centre’s captive bred birds, those which are housed in our display aviaries and our simmer flying demonstrations. If these youngsters are not retained by the sanctuary, they are exchanged with other breeding centres throughout the country in order to contribute to the national conservation programmes and help to retain healthy gene pools. This year, they were thrilled to have successfully hand reared a Red Kite chick. Two eggs were taken from the nest of our established Red Kite group and, not unusually, one was not viable. The remaining chick, however, came on in leaps and bounds and in a matter of weeks a handsome bird is starting to emerge from the original fluffy blob! This year’s new arrival is growing rapidly! Red Kites are slowly repopulating most areas of the British Isles again, having suffered a somewhat chequered history in the past. Although protected in medieval times due to their value as street cleaners and carrion eaters, these stunning birds were heavily persecuted in Tudor times - as Tudor streets became cobbled and relatively clean, kites had to look further afield for food and came to be perceived as unwanted competitors for game. At this time they also acquired a reputation for stealing clothes left out to dry, to decorate their nests. In Shakespeare’s Winter’s Tale, launderesses are advised that “when the kite builds, look to your lesser linen”! In 1560, red kites were added to a list of animals and birds classed as “vermin” and a bounty was posted on red kite carcasses. Numbers plummeted. Their unpopularity continued right through to the 19th. century, when they were considered a threat to pheasant stocks and new born lambs - in fact kites are not voracious killers, preferring to clean up dead meat and carrion. It is only since the turn of the 20th. century that kite numbers have started to recover in the wild thanks to a number of re-introduction programmes throughout the British Isles. These began with the setting up of a Kite Committee in Wales in 1904, which paid a dividend to farmers protecting Red Kites nesting on their land. Slowly, the Welsh population started to recover, due in part to the remoteness of some of the inhabited landscape and by 1992 there were 79 nesting pairs. In the next eight years this figure rose to 250. Once the Red Kite was well established again in Wales, it’s numbers slowly began to recover throughout the British Isles. Although unusual, it is now not a rare sight to see red kites soaring over the Chilterns and above the M40 and M4 beyond High Wycombe and Marlow , and even in the Suffolk skies, easily recognisable with their elegant motion and iconic forked tail. From Easter until the last weekend in September, life at S.O.S. becomes hectic for falconers and their charges! Three flying demonstrations are the focus of our visitors' attention, but the shows have to be fitted in between the always busy schedule of cleaning aviaries, feeding birds and maintaining their fitness levels, engaging with school parties and most importantly receiving, assessing, treating and rehabilitating injured wild owls and other birds of prey in the raptor hospital. As a charity, we manage this packed daily schedule on a precarious budget, substantially dependent on public donations. Consequently, we are indebted to our small army of volunteer helpers who work tirelessly (in all weathers!) to assist with all aspects of the falconers’ workload, rewarded only with the opportunity to get close to, handle and fly some of the sanctuary’s resident birds. Some volunteers work with us for many years, having found a niche in which they feel fulfilled; happy to help, in close proximity to the birds that they feel so passionate about. Other individuals wish to just dip into the work of the sanctuary for a few months to experience something out of the ordinary and gain skills that would otherwise have remained outwith their ken. Volunteers come from diverse backgrounds and all walks of life; students, nurses, policemen, service personnel, entrepreneurs, carers and their charges, full time grannies and those enjoying retirement. A wide variety of nationalities have also enriched the sanctuary’s cultural diversity over the years and we have received assistance from individuals from Spain, Italy, Sweden, Poland and the Netherlands. Owl and Taino the Ashy Faced Owl. In this context, volunteers not only contribute practical help, experience and wisdom to the day to day running of the sanctuary, they also offer another perspective on life in general and our role in the wider context of local community and international conservation issues. It is not only in the summer season that volunteers are so valuable to the management of the centre’s workload. During the winter months, when there are no demonstrations and the flying team rest and moult, the chores continue as the standard of care of the centre’s 80+ resident birds must still be upheld. 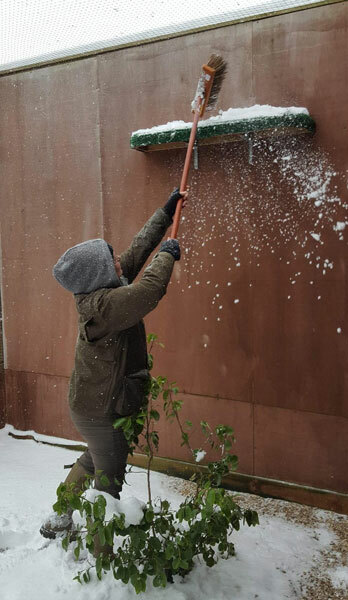 That the sanctuary could not run efficiently without the dedication of volunteers is an understatement.Through all seasons and in all weathers, our volunteers are crucial to the successful running of the sanctuary and the happy and healthy lives of the birds. From sweeping paths, to weighing birds, to clearing undergrowth - even to serving hot chocolate and mince pies during our annual Christmas event - all volunteers are priceless and we thank them all most sincerely for their help. Anyone interested in offering their services in this capacity would be most welcome - especially if they have time to spare at weekends! The only criteria are that interested applicants be consistent in their attendance, willing to turn their hand to all tasks and have a sense of humour and love of a frequent hot beverage! Further details can be obtained from volunteer co-ordinator, Liz Boyd via the the admin. office on 0345 680 7897, by email to liz@owlbarn.co.uk or from the sanctuary’s reception desk. As you can imagine, running a charity purely on the basis of donations these days is no longer the simplest of tasks, but it has to be said that the unflinching generosity of corporate sponsors together with private donators and well-wishers makes things a lot easier than they could be in the current climate of unrelenting financial pressure. The financial support of individuals is both much appreciated and thankfully admired, but as our collective grandmothers no doubt told us over and over, "Look after the pennies and the £'s will look after themselves". So, the Trustees of S.O.S. would also like to pay tribute to their loyal staff and trusty volunteers for foregoing many of life's luxuries - warmth, leaky office accommodation and a nearby toilet spring to mind - as they go about their daily duties without complaint and cognisant of our financial straits. Thanks, guys!! - without you, none of our endeavours in the sphere of the care and conservation of wild owls and other birds of prey would be possible. If there were medals given for frugality, you'd be the first in line. But it's not always cash & hard graft that make our place tick: we have also benefitted from the materials and manpower provided on a free-of-charge basis by many local firms who have played a valuable part in keep us going. Over the years Andrews Sykes, B&Q, Barclays Bank, Bardon Concrete, Clarkes of Walsham, The Co-OP, Eastern Concrete, Freecycle, Jewson and Lafarge have all stepped into the breach with supplies and muscle-power to help with maintenance and general upkeep. So now it's with pleasure that we add another - albeit slightly different - corporate sponsor to the roster - Birketts LLP. This highly successful local law firm have stepped in with the generous sponsorship of one of our latest arrivals, the Great Horned Owl hatched here just a few weeks ago, to help celebrate the firms 150 years in business. With offices in Ipswich, Norwich, Cambridge & Chelmsford, Birketts - who provide a full range of legal & financial services to businesses, institutions and individuals - will also be promoting the Sanctuary across the region through its many lines of communication to their customers and the public at large, helping us raise awareness about wildlife care & conservation interests of the Suffolk Owl Sanctuary. May we say thank you, and welcome! At the Suffolk Owl Sanctuary we are lucky enough to receive continued support in many forms from diverse sections of the community. The whole spectrum of such assistance ranges from one-off donations from members of the public, through participation in our Adopt-an-Owl and Wild Owl Nestbox schemes, to whole school fundraising activities and legacies in memoriam. Each and every penny donated to the sanctuary, by whatever means, is very much appreciated and is absolutely essential in order to secure future facilities for the rescue, treatment and rehabilitation of injured wild birds of prey, to develop outreach opportunities in local schools and colleges, to maintain and expand our nestbox scheme and to further engage with a wider audience in the context of wildlife conservation. The season of goodwill got off to a flying start this week with an extremely generous donation from the Norwich and Peterborough Building Society in Diss, Norfolk. Diss branch for their wonderful donation. As part of the Yorkshire Building Society group, the Norwich and Peterborough are understandably proud of their hugely successful fundraising and volunteering campaigns on behalf of deserving charities throughout the country. Indeed, the 2016 Third Sector Business Charity Awards saw the YBS group named Business of the Year as well as winning the Employee Engagement Initiative of the Year title for its colleague volunteering programme. This award scheme recognises the outstanding contribution many U.K. businesses make to good causes and the YBS group was selected by judges as the best example of a business that has “excelled in helping the wider community by embedding a culture of supporting charitable causes at all levels.” Their impressive record of charity work includes the donation of 11,800 hours of volunteer time during 2015, with the involvement of 35% of employees. Since its first donation in 1999, the Charitable Foundation has donated over £6million to charities and good causes and the Suffolk Owl Sanctuary was fortunate enough to be nominated for assistance by a staff member of the Diss branch. General Manager Maz Robinson and falconer Liz Boyd were invited into the building society today accompanied by Pip the Barn Owl and Titch the Tawny Owl to receive a cheque for 100.00 to assist with the ever increasing running costs of the sanctuary's raptor hospital. We would like to thank the inspirational Norwich and Peterborough staff and their very generous customers for this extremely helpful donation and hope that many of them will take the opportunity to visit the sanctuary soon to witness firsthandthe difference their contribution has made. We held our 'Christmas With The Owls' fundraiser this weekend, which was a great success. Over 500 families visited the Sanctuary over the last two days to visit Father Christmas in his marvellously decorated grotto, whilst Holly Owl and her Woodland Friends provided fun, games and selfies for all the youngsters - our falconer have never looked so smart as they did dressed up as rabbits, squirrels, hedgehogs, owls and bees! Our reception staff did a sterling job as Santa's elves welcoming people to the centre and showing them round. Meanwhile our avian residents looked suitably bemused by all the goings-on and the meerkats - as usual - relished all the attention they could get. The Suffolk Owl Sanctuary’s designated raptor hospital is busy at every season of the year, particularly during the Spring, when young, inexperienced owls and other birds of prey are finding their feet and testing their flying skills. During the autumn and winter months casualties usually present with injuries sustained from road traffic accidents or as victims of the colder weather which equates with depleted food supplies and loss of condition. 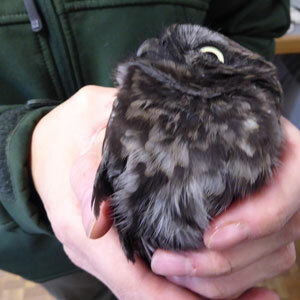 Earlier this month, a rather unusual case was brought to the hospital facilities by members of the public who had rescued the bird - a Little Owl - from their (dormant!!) wood burning stove. The couple had been aware of a scratching presence for a day or two and had presumed this was the sound of a bird making a nest on top of their chimney. Louder, more persistent disturbance alerted them to the fact that the mystery presence had travelled down the chimney, coming to rest within the back of the stove! By now exhausted, the Little Owl was easily extracted from the stove, popped into a covered box in order to alleviate stress as much as possible and then transported to us. “Sooty” arrived at the hospital looking slightly thin, VERY black, but (amazingly) otherwise unharmed. Suffolk Owl Sanctuary hospital facilities! His first port of call was the hospital bath! Soot and water form a sticky substance which is not easy to extricate from plumage, but with gentle teasing, the dedicated hospital staff were able to coax a little of the glutinous substance out of Sooty’s feathers. It quickly became apparent that there was no quick fix for the problem and that the washing process would have to be repeated several times in order for Sooty to regain his natural colouring. After five gentle, painstaking bathing sessions, a Little Owl emerged from the blackness and Sooty was thence on the road to recovery and rehabilitation. … but "I hope that’s the LAST bath I’ll need!" Starting to feel better already! Having been “out of action" for a week or two whilst being cleaned, Sooty then spent a couple of weeks in our rehabilitation aviaries in order to build up body condition and strengthen his flight muscles. On 4th. December his rescuers will return to the sanctuary to collect him for release back into his familiar habitat. I AM a Little Owl!! Since the recent downturn in temperatures, this may be a pertinent time to suggest extra vigilance (and chimney sweeping) before striking up the stove again! At S.O.S. we spend a considerable amount of time and human resources on outreach work, engaging with the younger generation and hoping to inspire a life long interest in conservation in future naturalists. Through a number of channels youngsters are educated about the role that owls and other birds of prey play in our eco-system and their necessity as indicators of the health of native habitat. During school term time, falconers and avian ambassadors spread the conservation message in classrooms across the whole of Suffolk. Children can either enjoy hour long workshop sessions in the classroom in the company of the birds or free whole school “taster” assemblies. During the long summer holiday, the sanctuary likes to keep in touch with its young supporters and offer a little extra holiday excitement in the form of its Young Falconers’ Course. This special half day event enables youngsters aged 10 to 14yrs. of age to spend some exclusive time with a falconer as they try their hand at some falconry orientated activities. Only four youngsters are booked into each course in order that everyone receives optimum instruction and plenty of “hands on” flying time with the owls. * Talk the Talk! - a brief tour of the aviaries to familiarise themselves with the Sanctuary's owls and other birds of prey. * Equipped for the Job - learning about the equipment used in falconry, trying their hand at making jesses and take their masterpiece home. * Walk the Walk! - flying owls and other birds of prey under a falconer’s instruction. * A Lasting Memento - taking part in a group photo with your fellow falconers and one of your new avian acquaintances. * Expert Tuition - taking a front row seat at the flying display and seeing how, with a few years of practice, their newfound skills can be developed into a spectacular performance! Short Stay for a Long Eared Owl!